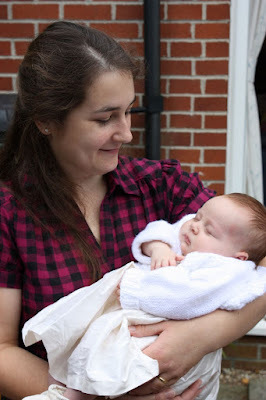 This post was inspired by Really Rachel who blogged this week about becoming a Godmother. I'm hoping it won't be a morbid post – I certainly wasn't intending it to be so. I don't pretend to be an expert on the topic of wills and I am not making any legal recommendation or statement by writing this blog – I just wanted to let you know why I personally feel that every parent should write a will. I know it doesn't bear thinking about, but just have a quick thought, just a tiny one, about what would happen if you passed away, leaving your child(ren) without their parents. Do you KNOW who would assume responsibility for them? Do you KNOW who would provide for them, and how? If you don't have a will in place, then the law makes these decisions for you, not your family or friends. Lara didn't have a Christening, instead we threw her a Naming BBQ last August. On that day, we named Lara's 'Godparents'. By that, I mean the people who we would choose to be Lara's legal guardians in the event of our deaths. Having discussed it with them (they thankfully agreed! ), we wanted to ensure that our wishes were documented thoroughly and in a way that was not open to mis-interpretation. We also wanted to ensure that Lara's guardians would be properly compensated for the time, effort and expense involved in bringing up someone else's child. There are lots of other things you can and should consider when writing a will, but these are the things that make it most important after you become a parent. The Mellow Family wills are not complicated documents. As a married couple, with plenty of close family, we have about the most 'standard' arrangement you can have. In most cases, our will is no different to how the government would choose to execute our estate if we were to have no will in place. For us, the only reason we HAD to write a will was to nominate Lara's legal guardians. If your relationship is a little more complicated, or if you are a single parent, it's probably all the more important that you document your wishes for inheritance and for guardianship. Writing a will doesn't have to be an expensive process. As long as you have a written statement of your wishes, and that at least someone you may leave behind knows where to find that written statement, that should suffice. You can choose to write your own will using a template that you can buy online, or in some high street stores. If you want something more official, you can invite a will specialist to your home to prepare a document full of appropriate legal jargon (which is what myself and Mr. B. did when we first wrote our wills after taking out a mortgage together). Or (as we did after Lara was born) you can approach a solicitor to do the full she-bang, packed full of complicated legalese:- it'll cost the earth but at least you'll know that you've covered all your bases and that it has been written by someone who knows how the probate system works, and how your will is likely to be executed in the event that it is needed. For more information (in the UK) on why and how to write a will, take a look at the DirectGov website. Can Reusable Nappies Work With A Childminder?